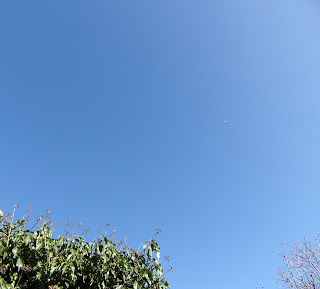 We have actually enjoyed some sunshine today, which has been lovely. This was the sky this morning. I had a look in the garden and saw a small number of double snowdrops. They always need to be lifted up in order to appreciate their lovely markings. One of my hellebores is flowering too, but also needs to have its head lifted up. This is the best clump this year. I do have two other plants, but they are still in bud. Cyclamen coum and snowdrops in a pot together. 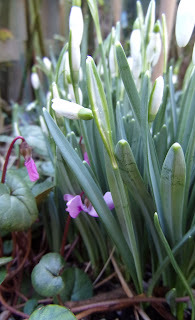 Snowdrops, crocus and a grape hyacinth also in a pot together. 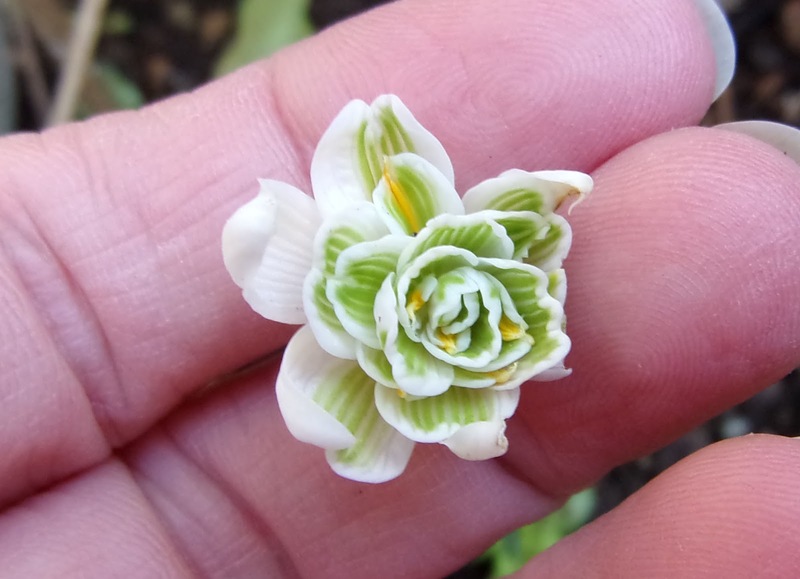 I should probably divide the snowdrops once they have finished flowering. 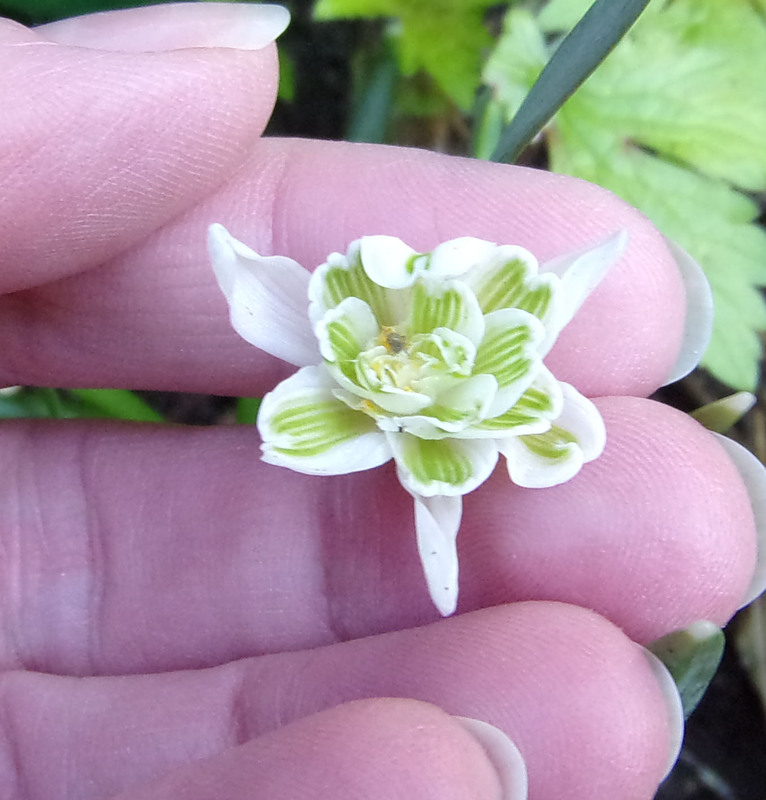 Finally, a second double snowdrop with the lovely green and white combination. I think the flowers were as pleased to see the sunshine as I was! Thanks, Amy. I would love to have more hellebores because I find their markings so interesting, but I really don't have room for more, so I have to content myself with three. The double snowdrops don't seem to build up like the other snowdrops do, so when they appear, I always like to show them some attention! LOVE the double snowdrops. I haven't seen there here, and lust after them. I will have to explore the nurseries. Thank you. Thanks, EC. The double snowdrops I have got are Galanthus Nivalis Flore Pleno, if that's any help tracking them down. They haven't spread but that could be because I haven't put them in the perfect spot. Good luck with tracking them down. 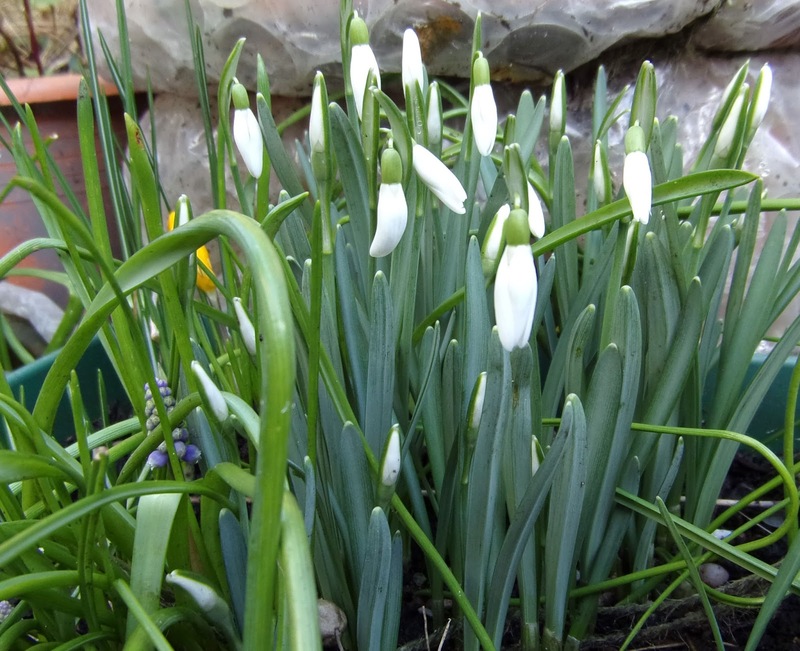 Your garden is starting to show it's spring colours, the double snowdrop is beautiful. One day I'm going to come & visit your lovely garden. Thanks, linny. 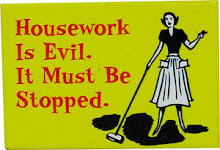 You would be very welcome (if you could manage to sidle past the huge number of pots I have in a very small garden!). I do like this time of year with the snowdrops and hellebores. Thanks, DD. 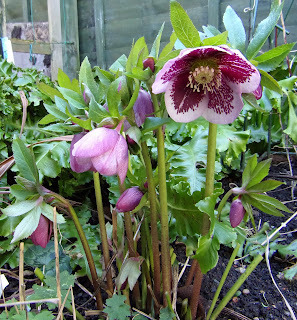 My other two hellebores don't want to wake up yet either. A little bit of sunshine makes everyone feel better, doesn't it? 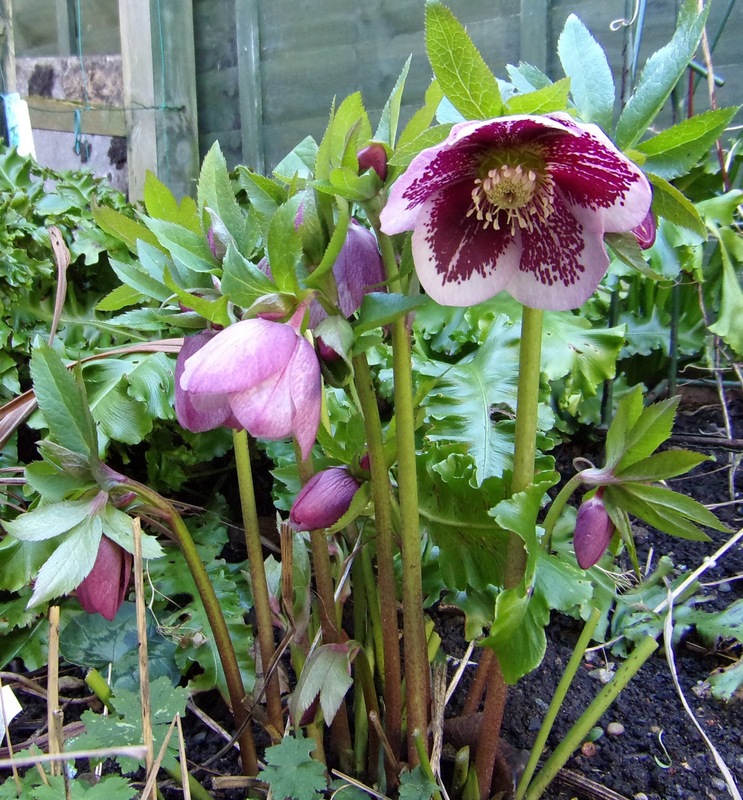 I want some hellebores, they look lovely, I have never grown them. Thanks, Marlene. 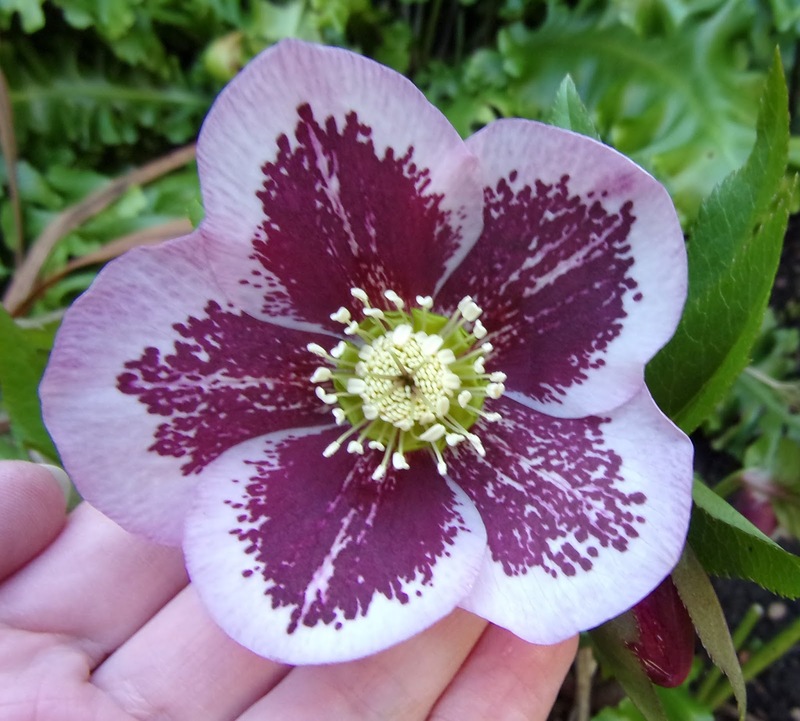 Hellebores are beautiful late winter/early spring plants and you can get lots of different types, including double flowered ones. Mine are in a slightly shady area, but they do get some sun. I have found them easy to care for as all you have to do is cut the old foliage off, either in late autumn or early spring, to allow the new leaves and buds a bit of room. I hope you manage to get some. Thanks Kim, hello and welcome. The double snowdrops are very lovely although you do need to lift their heads up to see all the petals. The ones I have got are Galanthus Nivalis Flore Pleno (rather a mouthful), in case that might help with your search. They don't seem to bulk up like the single snowdrops do, but that makes each flower just that little bit more special. Thanks, CT. Yes, it is lovely and I think everything benefitted from a little bit of sunshine too. 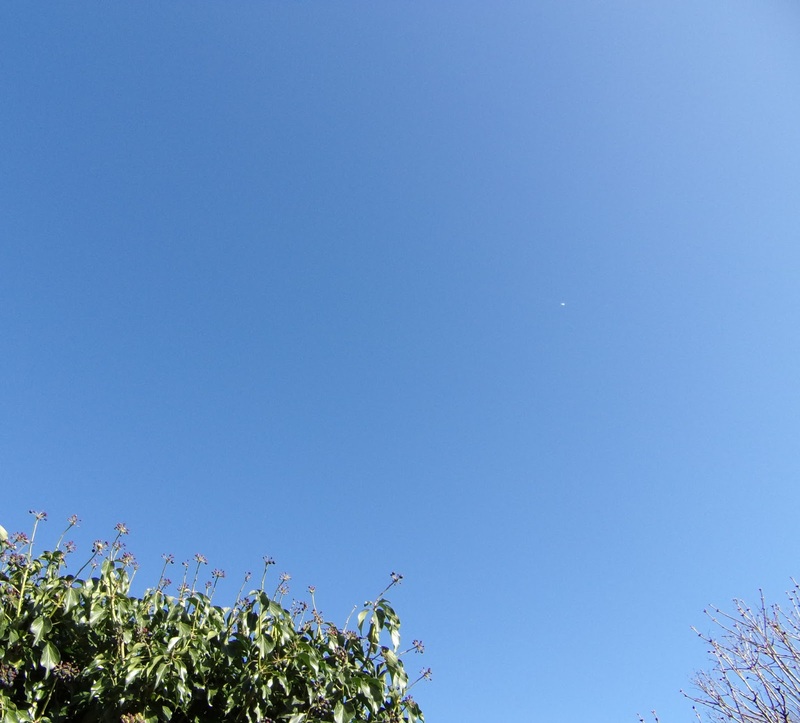 Isn't it wonderful to see a bit of blue sky for a change. We've had frosty starts yesterday and today but the sun has put in an appearance and it really does lift the mood. I love it when the spring bulbs start to break through the soil and burst in to flower. You look to have some good clumps of snowdrops. I've never planted any but there's some in the garden which were here when we arrived more than twenty two years ago, yet they've never bulked up at all, such a shame.